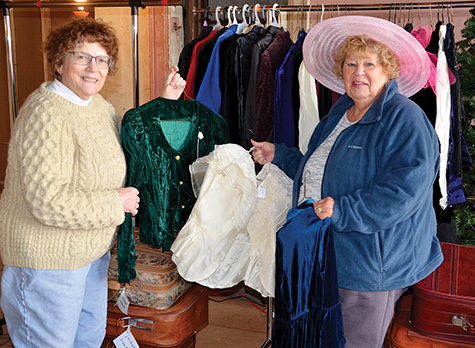 Casey O’Neill (left) and Linda Clemans, members of the Friends of Mount Sterling Public Library, display items from O’Neill’s collection of vintage clothing. O’Neill has organized a pop-up fitting shop in a storefront in Mount Sterling, where she will outfit anyone who wants to borrow clothing for the Friends of the Library Victorian Sweetheart Tea set for Feb. 16 at Mount Sterling First United Methodist Church. Casey O’Neill hauled in suitcase after suitcase, each one carefully labeled: “blouse juvenile petite 2-petite 4;” “jacket size 6-8,” and so on. From the suitcases, she pulled velvet jackets in blues, burgundies and emerald greens, blouses layered with lace, and skirts that flowed to the floor. At the end of one clothing rack sat a box overflowing with broad-brimmed hats in a riot of hues, from delicate pink to look-at-me silver. “I’ve been collecting vintage clothes for 25 years. It’s an obsession,” said O’Neill, who has amassed her trove of throwback threads at thrift stores and church rummage sales. O’Neill has put the collection to good and varied use over the years. When she taught fourth and fifth grade at Mount Sterling Elementary, she outfitted students for a “Famous Ohioans” segment. She is a great costume resource for community theater productions. And for the past six years, much of her collection has been on display–on people–at the Victorian Sweetheart Tea, a Friends of Mount Sterling Public Library fundraiser. Once again, O’Neill is lending out pieces from her collection to anyone planning to attend the tea, which will take place this year from 2 to 4 p.m. Feb. 16 at Mount Sterling First United Methodist Church. Last week, she began organizing a pop-up fitting shop at a vacant downtown storefront between Ben & Joy’s Restaurant and Kustom Floors. While vintage apparel (or apparel that looks vintage) is not required to attend the tea, it is what makes the event unique. “When Casey first suggested dressing up for the tea, a lot of us weren’t so sure about it, but it’s become a big smash,” said Melissa Reece, assistant librarian. Besides a Civil War-themed New Year’s Eve Grand Ball in South Charleston and a fancy tea in Washington Court House, there’s nothing in the area quite like Mount Sterling’s Victorian Sweetheart Tea. “We held the first tea in 2013 at Ben & Joy’s and had about 20 people. It’s expanded so much. 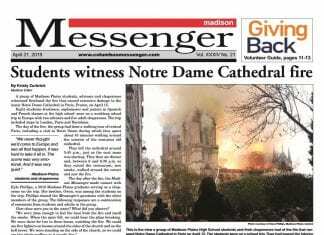 Now, we hold it at the church and we’re expecting 75 to 80 people,” Reece said. An entire Girl Scout troop makes a point of attending each year. The Washington Court House Red Hat Society has already let organizers know they’re coming again. 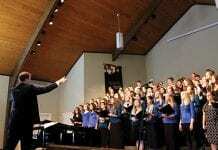 Many sets of grandmothers, mothers and daughters have turned the event into a family tradition. “We give prizes for things like longest distance traveled, number of guests brought, most and fewest birthdays, best costumes, and birthday closest to Queen Victoria’s (May 24, 1819). One year, we gave a prize to the only man who attended,” O’Neill said. Friends of the Library members and library staffers make or buy and donate all of the food for the buffet, including tea sandwiches, fruit, scones, pastries, desserts, flavored teas and pink lemonade. Members of the Madison-Plains High School Key Club dress up and provide tableside tea service. In addition to the tea and treats, the event includes a boutique stocked with Victorian-inspired and tea-themed items for purchase–cups, saucers, teapots, doilies, handkerchiefs, linen napkins and knickknacks–more of O’Neill’s thrift store and rummage sale finds. A purple velvet curtain provides the perfect backdrop for individuals and groups to capture photos of the fun day. Pre-sale tickets are available at the library, 60 W. Columbus St., and are $5 for children 10 and younger and $7 for adults. The price goes up $1 for tickets at the door. Anyone who would like to borrow clothing to wear to the event can contact O’Neill to make an appointment, (740) 869-3548. She is happy to lend out items at no charge. She also will have hats and bonnets, including a handful of hats for men, available the day of the tea. For more information about tickets or the Friends of the Library, call Mount Sterling Public Library at (740) 869-2430.